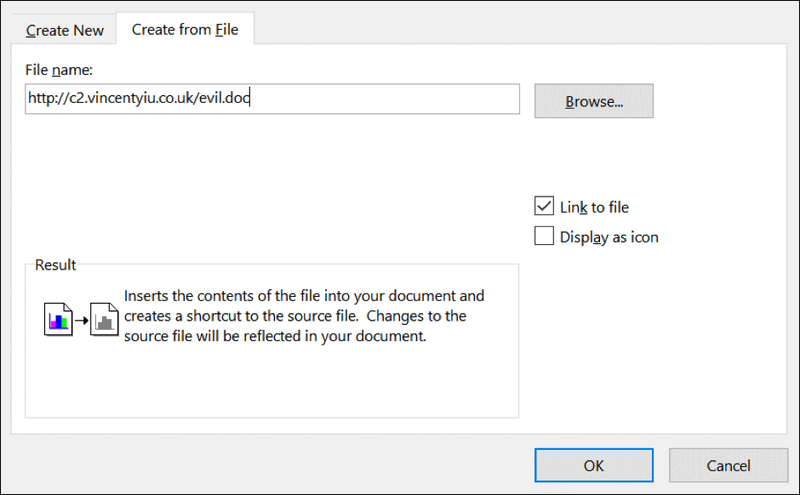 FireEye recently documented attacks of a 0-day vulnerability in the Windows HTA handler being exploited in the wild using Office RTF documents. 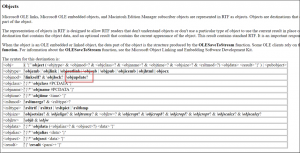 The vulnerability later became referenced as CVE-2017-0199 and addressed in the April 2017 Microsoft Update. Neither the sample or any specific information were released on how to reproduce the vulnerability, however it was particularly interesting to the ActiveBreach team because it was capable of bypassing known exploit mitigations such as EMET. This blog post describes how to exploit this issue without user interaction based on our research; the technique discussed may differ from that used by the threat actors. It is also important to stress that the issue is not just restricted to RTF documents, we have successfully exploited this using other Office document types also. 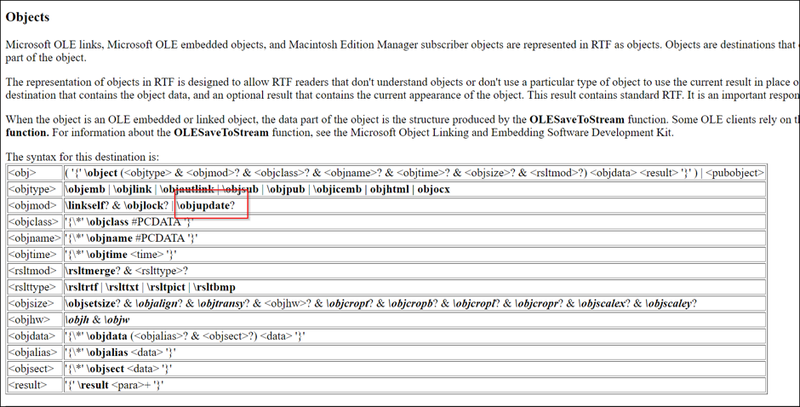 While the technical steps to reproduce the issue as described by FireEye are sparse, the article contains several hints; firstly that the issue occurs using an OLE2 embedded link object, secondly while handling a HTA file. 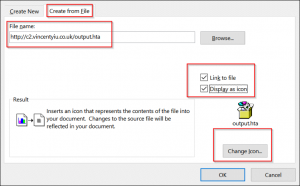 Select Create From File, insert the URL to the HTA file and tick both Link to file and Display as Icon. 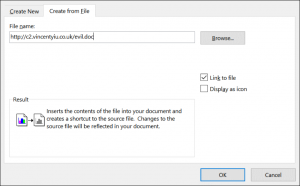 Save the document as a DOCX, DOC or RTF file; all of which handle OLE2 link objects. 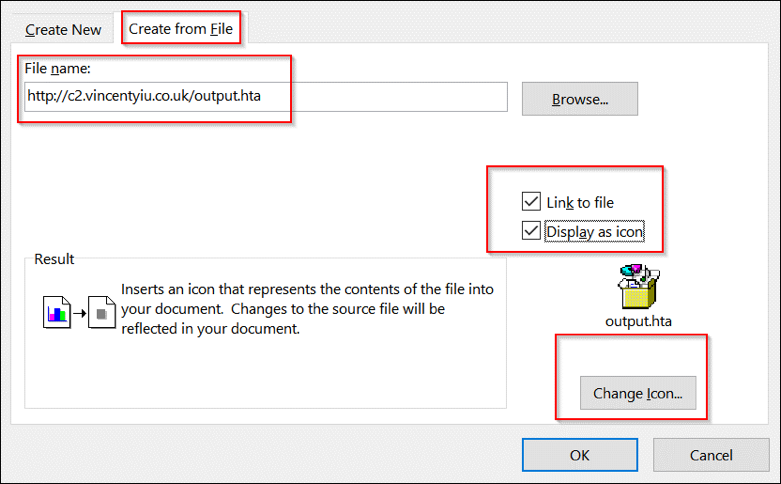 However, user interaction is still required and the user must double click on the “hello” text this time or save the file to force the document to perform the connection to update the content and display it. It’s also worth noting that our research shows that if the user does not have Microsoft Office installed, the issue can still be exploited in WordPad however interaction is required. A number of Yara rules have been released by the response community to detect this issue. In many cases these are somewhat inaccurate and may generate false positives as they rely on detection based on an RTF document containing an OLE2Link object. This does not necessarily imply malicious behaviour and may be a legitimately embedded object. To effectively detect CVE-2017-0199, Yara rules should add a condition to identify the \objupdate control. This blog post was written by Vincent Yiu of the MDSec ActiveBreach team. We would also like to thank Etienne Stalmans for providing guidance on this issue. Our ActiveBreach team simulate the TTPs of real adversaries to assess your organisation at each step of the cyber kill chain. Our mobile assessments are backed by global training, publications and the Mobile Application Hacker’s Handbook. Ready to start testing your applications? Speak to one of our industry experts and find out how MDSec can help your business.